Fly me to the moon, just don't fire me while I'm recovering from the trip. 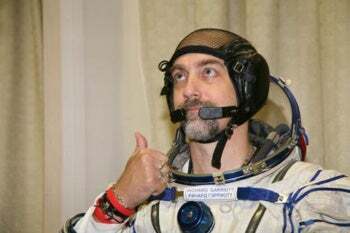 That's the gist of a complaint filed by Ultima creator and nascent citizen space spelunker Richard "Lord British" Garriott against his former employer, Korean games publisher NCsoft, after the two parted ways late last year. At stake: $24 million. At issue: Whether Garriott voluntarily resigned, or was involuntarily terminated. Per the complaint, filed yesterday in the Texas Western District Court and picked up by the Entertainment Consumer Association's games blog, NCsoft "sought to defraud" Garriott of his stock options, to the tune of multiple millions of dollars. The suit, reads the complaint, is thus "to redress that breach of the multi-million dollar option contract, or in the alternative, to recover damages for the multi-million dollar fraud perpetrated on him by NCsoft." 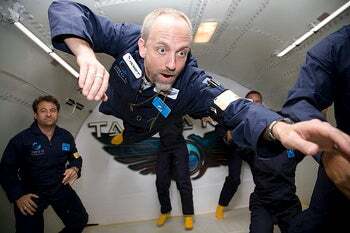 Remember all the hullabaloo about Garriott's $30 million space trip last fall? According to Garriott's legal team, in November 2008 — shortly after his terrestrial return — the president of NCsoft's North American division told Garriott that NCsoft wished to "part company." Garriott reportedly objected to the dismissal, but was let go anyway. Trouble is, Garriott says NCsoft then reclassifed his termination as a "voluntary resignation," which had "a profound and detrimental effect" on Garriott's stock options. If NCsoft actually terminated Garriott, his stock options — allegedly worth tens of millions of dollars — would remain effective until 2011. If Garriott simply resigned, however, NCsoft could put the kibosh on said options unless Garriott exercised them within 90 days of leaving. Spot the train wreck? Fire a pseudo-celeb of Garriott's relatively well-known stature, watch your stock price and share value plummet, then reclassify your ex-employee's departure as "voluntary," forcing him to cash out when the stock's at its theoretical nadir. Garriott's lawyers call that a Hobson's choice in the complaint, which if the allegations are contextually accurate, it probably is. Per this lawsuit, not so fun, it seems, for Garriott and NCsoft.